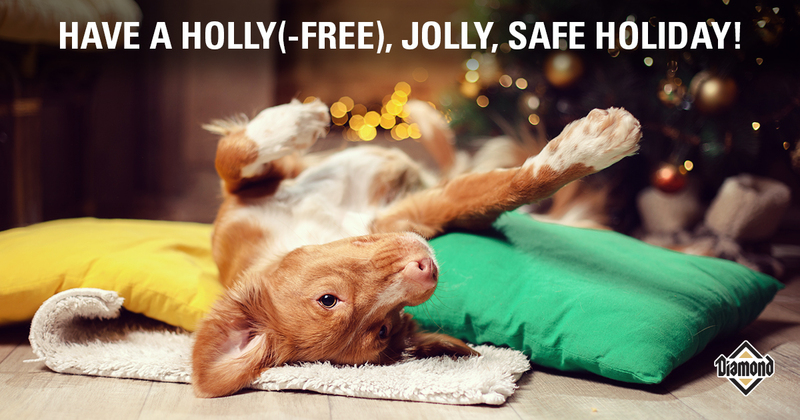 The holidays might be the most wonderful time of the year, but they’re also accompanied by several seasonal dangers for your pets that could take the ho-ho-ho out of your holiday celebration. The good news is you can prevent most, if not all, holiday-related trips to the veterinary emergency clinic with some planning and old-fashioned common sense. Here are some easy-to-follow tips you can work into your holiday decorating activities to help keep your pets safe. Keep pets out of the tree stand water reservoir. If you get a real tree, you may want to skip the Christmas tree food or preservative. In fact, the American Veterinary Medical Association (AVMA) recommends not adding anything — aspirin, sugar or commercial tree food — to your Christmas tree water if you have pets in the house. Commercial preservatives generally contain small amounts of fertilizer and dextrose (a type of sugar). Although today’s products are less toxic than older products, they can still cause mild vomiting and diarrhea if your pet drinks the tree water. Secure your tree. More than one crafty cat has been caught climbing or hiding among the branches of a Christmas tree. 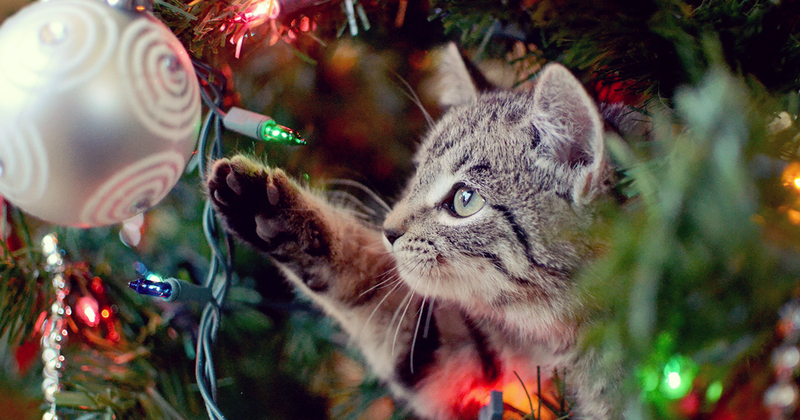 To keep kitty from turning your holiday tree into a playground, set it up in a room that can be closed off with doors. It’s also a good idea to secure your tree to the ceiling and/or upper wall using fishing line or transparent nylon thread to keep it from toppling over if your cat does climb it. Skip the tinsel. Cats especially are attracted to tinsel, which dances and sparkles with the slightest air movement. But tinsel can be dangerous if swallowed. Pets who eat tinsel can develop a digestive tract blockage, severe vomiting and dehydration. Hang fragile ornaments up high. Or, better yet, use fragile ornaments on shelves or mantles, not the tree. Keep in mind, too, that many ornaments may look like colorful toys or bite-size snacks to curious or playful dogs and cats. Broken ornaments can lead to cuts, while eating small ornaments or pieces of them may cause intestinal damage or blockage. Avoid edible ornaments. Strings of popcorn, holly berries or cranberries, and other “edible” homemade ornaments can look like yummy pet treats. However, snacking on such edible decor could cause choking or other illnesses in dogs and cats. If you use homemade ornaments, especially those made from salt dough or other foodstuffs, be sure to hang them out of your pets’ reach. Amaryllis. According to Pet Poison Helpline, amaryllis has mild to moderate toxicity for pets who chew on or eat any part of the plant, including the bulbs. Leaves, stems and bulbs contain substances that can cause vomiting, a drop in blood pressure and a slowing of a pet’s breathing rate. Amaryllis bulbs also contain concentrated amounts of crystals that cause excessive drooling and abdominal discomfort. Poinsettia. According to the ASPCA Animal Poison Control Center and Pet Poison Helpline, the potential “poisoning” of pets by poinsettias has been greatly exaggerated. In fact, animal studies have shown that the deadliness of this festive plant isn’t true. However, it’s still a good idea to keep them away from pets. The milky white sap of poinsettias contains chemicals that can cause drooling, vomiting and, rarely, diarrhea when ingested. If skin is exposed to poinsettia sap, irritation (redness, swelling, itchiness) can occur. Holly. Spiny holly leaves can injure the lining of the mouth or obstruct the digestive tract if a large number are eaten. Holly berries contain a substance that may cause lip-smacking, vomiting, diarrhea, appetite loss, head-shaking and decreased activity if eaten by pets (or people). Mistletoe. Several varieties of mistletoe can be poisonous to pets, and all parts of the plant contain multiple substances that are toxic to both dogs and cats. Small amounts may produce signs such as vomiting, drooling, diarrhea and abdominal pain. If a large amount of mistletoe is eaten, however, your pet could experience a slowed heart rate, difficulty breathing, low blood pressure and odd behavior. Lilies. 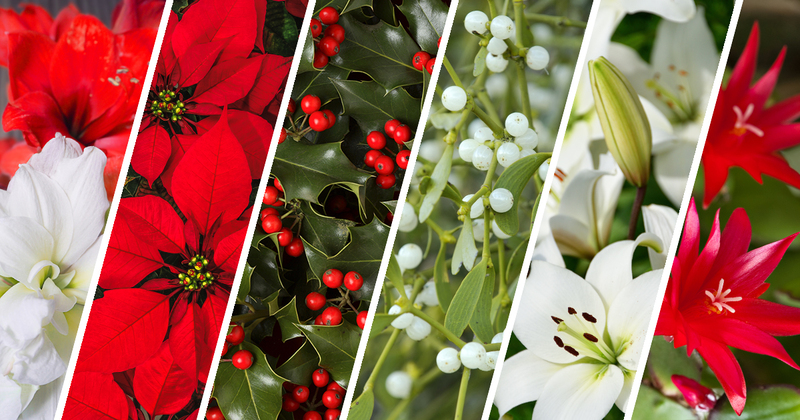 While many people don’t associate showy, fragrant lilies with winter holidays, these big, beautiful blooms are actually quite common in holiday flower bouquets and arrangements. If you have a cat, you may already know that members of the true lily family (Lilium and Hemerocallis spp.) can be lethal. Even a small exposure — such as a few bites on a leaf, a lick or two of pollen from fur, or drinking water from the vase of the floral arrangement — can result in acute kidney injury and failure. Christmas cactus. According to the ASPCA Animal Poison Control Center, Christmas cactus is not toxic to dogs or cats. However, if your dog (or cat) eats the plant, the high-fiber greenery can irritate the stomach and intestinal lining, which can lead to vomiting or diarrhea. Secure, hide or cover electrical cords. Holiday lights and decorations often lead to new cords being scattered throughout the home, which some pets love to chew. But chewing on live electrical cords can lead to burns in or around a pet’s mouth, difficulty breathing, seizures and even cardiac arrest. To protect your pets, tape down or cover any exposed cords or keep them completely out of pets’ reach. And don’t forget to unplug lights and other electrical cords when you’re not home. Keep potpourri out of pets’ reach. Fragrance from potpourri and scented candles can add to a home’s holiday ambience. However, both liquid and dried potpourris can be poisonous to pets, especially cats. Liquid potpourris contain essential oils and cationic detergents that can cause severe injury to your pet’s mouth, eyes and skin. Solid potpourris can also cause health problems if eaten. Keep open flames inaccessible to pets. Carefully watch your pets if you’re lighting candles, menorahs and luminaries, and use a screen in front of fireplaces. Although a flameless alternative may not be as pretty or dramatic as a traditional taper, the substitution could prevent a trip to the emergency veterinary hospital for your pet or a call to the fire department for you. Traveling house guests are common during the holidays. And, all too often, they leave open suitcases on the guest room floor where pets can easily get into prescription medications that may be kept in plastic bags or pill boxes. To avoid a trip to the pet ER, tell house guests to keep their medications out of reach of pets (and young children), and recommend that the door to the guest room be kept closed as well. Finally, there are plenty of holiday foods that need to be kept away from pets, including chocolate and alcohol. Let guests know that any wrapped gifts containing food or candy should not be placed under the tree where your dog can get to it. Yes, dogs can still sniff out chocolates and other foods despite being boxed and wrapped in holiday paper! The best present you can give your pets (and yourself!) this season is safety. Why not put that in their stockings?